A newly discovered, bird-like dinosaur fossil from China used a shaggy ruff of rainbow feathers to attract mates. AUSTIN, Texas — Ancient dinosaurs were adorned in some amazing ways, from the horns of the triceratops to the plates and spikes of the stegosaurus. A newly discovered, bird-like dinosaur fossil from China contains evidence that could add a new accessory to the list: a shaggy ruff of rainbow feathers. A team of researchers, including scientists from The University of Texas at Austin, are the first to conduct an in-depth study of the dinosaur and describe it. They dubbed it Caihong juji—a name that means “rainbow with the big crest” in Mandarin—and think the dino used its flashy neck feathers and a bony crest on its snout to attract mates. A description of the exquisitely preserved, chicken-sized dinosaur was published on Jan. 15 in the journal Nature Communications. Dongyu Hu, a professor in the College of Paleontology at the Shenyang Normal University led the study. Aside from making Jurassic ecosystems of 161 million years ago more colorful, the dinosaur is interesting because it has features that are both ancient and modern, said co-author Xing Xu, a professor at the Chines Academy of Sciences. The bony crest is a feature usually seen in dinosaurs from earlier eras, while its neck feathers show evidence of microscopic wide, flat, pigment-containing packages, or melanosomes, that may represent the first known occurrence of iridescence similar to that found in a variety of hummingbird species living today. “There are crests associated with sexual selection previously known only in earlier dinosaurs, and yet there is also a bird mechanism of signaling or display appearing for the first time,” said Clarke, who helped lead the study with Hu and Xu. Caihong is also the earliest known dinosaur with asymmetrical feathers, the feather type found on the wingtips of modern birds that helps control flight. 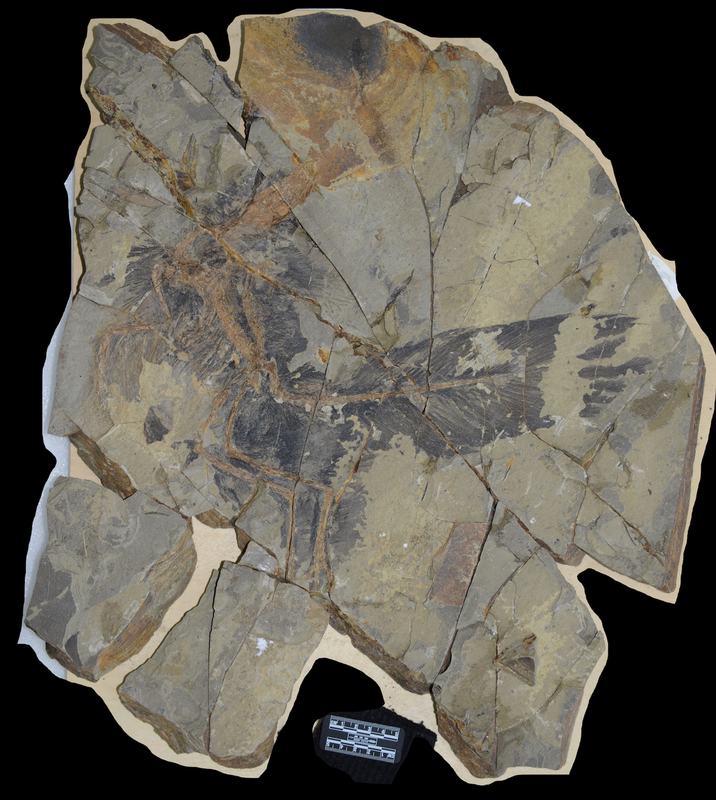 But unlike birds today, Caihong’s asymmetrical feathers were on its tail, not its wings—a finding that suggests that early birds may have had a different steering or flight style. The slab of rock from China’s Hebei Province where the dinosaur was discovered by a farmer in 2014 contained a nearly complete skeleton surrounded by impressions made by feathers. The impressions preserved the shape of the melanosomes. Researchers compared the melanosome impressions to melanosomes found in living birds and found that they most closely resembled those in the iridescent, rainbow feathers of hummingbirds. Caihong is part of a group of small, bird-like dinosaurs that lived in China during the Jurassic, Xu said, but it stands out even among its closest relatives. While the other dinosaurs have bird-like, triangular skulls and long forearm bones in comparison to birds today, Caihong had a long and narrow skull, and unlike many of these other dinosaurs, its short forelimbs show proportions more akin to modern birds. The next step is figuring out what factors influenced Caihong to evolve such a distinctive look, rainbow feathers and all, said co-author Chad Eliason, a postdoctoral associate at the Field Museum of Natural History. He helped analyze the microstructural fossil evidence for color in the new specimen while he was a postdoctoral researcher at the UT Jackson School of Geosciences. This combination of old and new traits, said Eliason, is evidence of mosaic evolution, the concept of different traits evolving independently from each other. “This discovery gives us insight into the tempo of how fast these features were evolving,” he added. Quanguo Li, a professor at the China University of Geosciences in Beijing and Matthew D. Shawkey, an associate professor at the University of Ghent in Belgium also participated in the study. The research was funded by the U.S. National Science Foundation and the National Science Foundation of China.